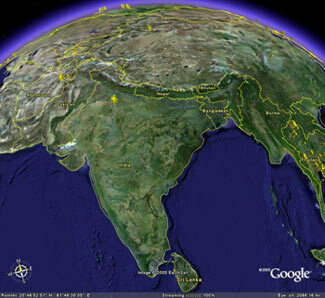 Google’s virtual globe program Google Earth’s high resolution satellite images have been posing a great threat to have the Indian Space Research Organization (ISRO). The high resolution satellite images that Google Earth offers to millions of users all over the world, has got ISRO chief extremely tensed, who has asked for a discussion with Google officials to discuss the same. As of now, several high security areas are on display, along with explicitly visible defense headquarters and airfields. According to IAF officers, the detailed images could help enemy forces get clues to the number of aircraft in serviceable condition by the manner in which they’re parked. ISRO chief G Madhavan Nair told a news channel that the foreign satellite images by Google, of sensitive military areas are of great concern to India. He stressed on the fact that in global interest, it is necessary to persuade Google, that fine details like these should not be displayed on a public domain. “…some of the places, they have collected images from foreign satellites and that comes to one metre (resolution) and better. For example if you take Bangalore or Delhi, they have given fine pictures — which normally one is not supposed to do,” ISRO chief G Madhavan Nair said on the news channel. Experts say that these satellite images are not of concern to developed countries because their regulations permit right to information, and advanced space applications. However, India’s security parameters require that operational competence and capabilities are kept under the veil. India may have to alter its Official Secrets Act, along with the regulations which govern the National Remote Sensing Agency (NRSA) for a better legal foothold in this matter. “I think our defence agencies should be worried about it. They have to work out some method by which we can (do something)…we need not display anything,” Nair remarked. “We have to have a dialogue with them, convince them that in the global interest, especially in the security environment we are facing today, we should not be putting fine details on a public domain,” Nair said when asked how Google can be deterred from displaying images of sensitive locations. Although Google has pointed out that the satellite images are not live and may have been taken months back, several governments, including South Korea and Thailand, have expressed similar concerns.